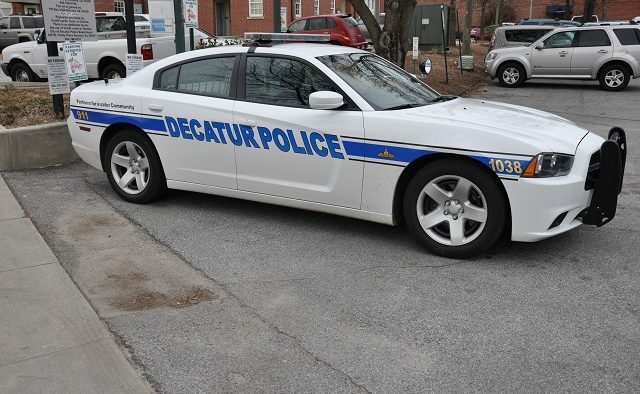 Decatur Police responded to a carjacking on Feb. 1, the third carjacking incident to occur within or near Decatur within the last five weeks. According to Lt. Jennifer Ross, police responded to the call around 11:57 p.m. on Feb. 1. It occurred in the 1100 block of South Candler Street. Suspect #1: Black male, late teens-mid 20’s, approximately 6’2, thin build, wearing a hoodie (unknown color), with a red bandana over his face and armed with a black semi-automatic handgun. Suspect #2: Black male, late teens-mid 20’s, approximately 6’1, heavy-set build, wearing a grey hoodie and armed with a silver semi-automatic handgun. The stolen vehicle is a 2004 black Toyota 4runner displaying GA tag #PAK2879. “If you have any information about this incident, please contact Inv. Lindsey at robert.lindsey@decaturga.com or 678/553-6628 or contact Crime Stoppers Greater Atlanta at 404-577-Tips (8477) and remain anonymous,” Ross said. Decatur Police responded to an attempted carjacking on Jan. 4 in the 800 block of Derrydown Way. “The victim reported she arrived to the area and parked on the street against the curb,” the Police Department reported. “The victim was approached by the suspect while she was still seated in her vehicle. The suspect asked to use the victim’s phone and she informed him it was dead. The suspect then stated he was stranded in the area and was waiting on friends. The suspect then produced a handgun from a small bag he was carrying over his shoulder and pointed it at the victim, ordering her to relinquish her vehicle. On Jan. 25, a woman was kidnapped on Derrydown Way and sexually assaulted. The carjacking occurred close to the Decatur city limits and was handled by DeKalb County and Atlanta city police. According to reports from the DeKalb County Police Department and the Atlanta Police Department, the victim, a 19-year-old woman, was waiting in the 700 Block of Derrydown Way for her boyfriend to get off work. A man wearing a camouflage ski mask approached her, according to the Atlanta Police Department’s report. The suspect pointed a gun at her through her driver’s side window and ordered her to drive him around Atlanta. The victim says they wound up at the dead end of Ollie and Lena streets. The suspect asked the victim for “sexual favors,” the Atlanta Police report says, but the victim said no. According to the DeKalb County Police report, the suspect also sexually assaulted the victim. The Jan. 25 incident is not believed to be connected to the Jan. 4 incident. The suspect in the Jan. 25 incident is described as a black male, 30-45 years old, wearing a camouflage hooded sweatshirt, tan cargo pants and armed with a black handgun. It is unclear whether the latest incident is connected to any of the others reported last month, including one that happened in Tucker. On Jan. 21, there was a carjacking incident that occurred at Sprouts in Tucker.